Karni Bhawan, A Heritage Hotel in Jodhpur home of the erstwhile Jagirdars of Sodawas, Bhati Rajputs of the Lunar dynasty.This delightful red sandstone bungalow of the 40’s has been sensitively redone to meet the requirement of the discerning travellers. Lush green gardens combine a homely spirit with personal care of the family to make a stay at Karni Bhawan A Heritage Hotel in Jodhpur is very good value indeed. Karni Bhawan’s exclusive cuisine from the ‘Kitchens of the House of Sodawas’ is a special highlight, the team of its Chefs have delighted the Swiss in Switzerland for the ten consecutive years with food festivals in Zurich, Luzern, Lausanne & Bern at leading hotels and till 2001, they have also successfully conducted the Sodawas food festivals at all the Metros of India. The cuisine is so popular, that we have been invited again and again for this festival. Hence at Karni Bhawan, it is a food festival every day. We have just introduced an open air pool-side restaurant SHAHEE KEBAABEE KORMA. The restaurant that offers a whole range of exciting Tandoori,Punjabi and some Chinese dishes which one must try. 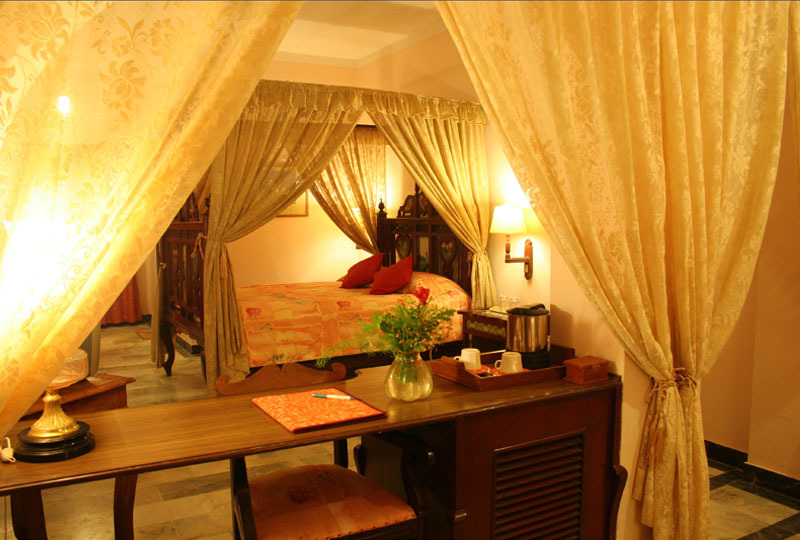 This Colonial bungalow was first converted into a Heritage Hotel which had 12 rooms in 1986. By the year 1994 the hotel had expanded to a strength of 31 luxury air conditioned rooms and suites. All the 30 rooms and suites posses ethnic designs of Rajasthani festivity themes.All the rooms have modern attached baths with running hot and cold water. Another unique feature of Karni Bhawan A Heritage Hotel in Jodhpur is the personal care taken by the Owners and the Management of the hotel and the hospitality extended to each guest. Each Bedroom has special ambiance and charm. Breakfast buffet at Tashli or Mosaic courtyard. Dinner buffet with live music and camp-fire at Dhani. During Summer, Pool side dinners can be arranged. Herbal oil massage: on request at Reception. Village Safari: To sight Wildlife/To visit the dwellings of different tribes, such as the Brishnois. “Dhani,” the Marwari word for a group of dwelling huts built away from the community village, often in the wilderness or on the owner’s farm land. Karni Bhawan’s Dhani, set in one corner of the garden area, is an authentic creation that highlights the enjoyment of your lunches and dinners.